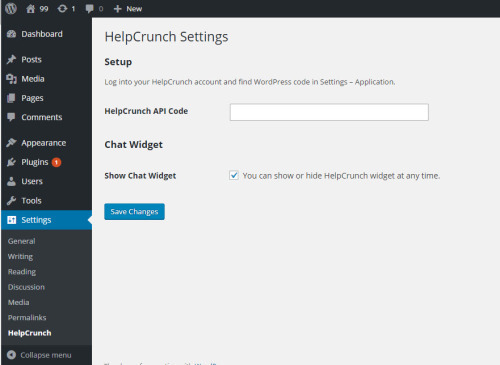 HelpCrunch integration just got a lot easier with WordPress Plugin. Without a single line of code you can connect HelpCrunch with your website in a matter of few minutes! Once it’s done, you can start talking to your customers in real time via live chat, send targeted emails and messages to a specific group of customers, and automate marketing activities within customer lifecycle. 1. Register HelpCrunch account or log into your existing HelpCrunch account to find HelpCrunch API code for WordPress in Settings – Applications. 2. Copy the code and paste it on HelpCrunch plugin settings page in WordPress. Save the settings and activate the plugin. Voila! Check your website to find HelpCrunch chat widget there. Don’t forget to customize it, so it fits your website and encourages your customers to drop you a message, ask for support, share feedback, etc. Find more information about HelpCrunch here.